This is another Donna Hay recipe. She doesn’t squeeze the excess out of her potato but it’s how I’ve always done mine so I stuck with it. I loved the porcini salt but getting it to a powder took some time! Pop the potato in a clean tea towel and squeeze out the excess liquid. Mix the potato with the rosemary, melted butter and a little seasoning. Form into patties, pushing down. Whizz up the mushrooms and salt in a processor until it becomes a fine powder. Oil the steaks then sprinkle over some of the porcini salt. Heat some oil in a pan and cook the rostis for 3-4 minutes on each side. Keep warm whilst you cook the steaks to your liking. Let the steaks rest then sprinkle with some more of the salt. 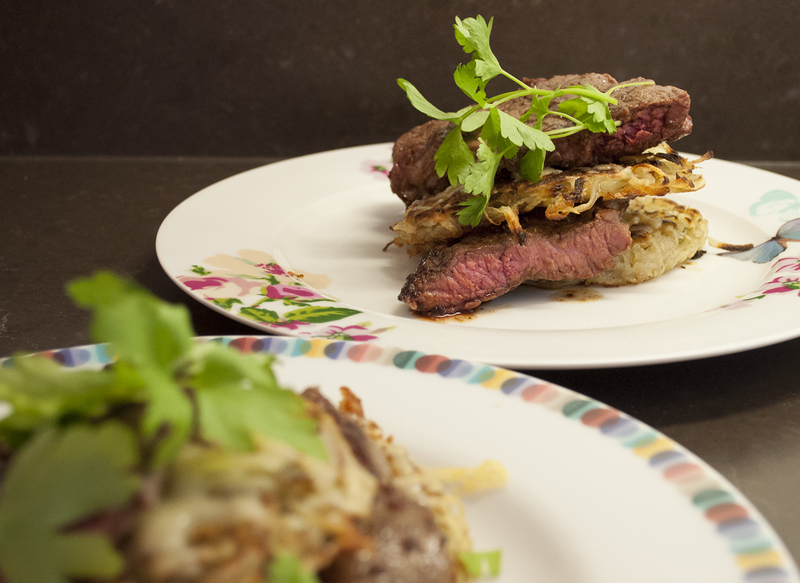 Heat the grill and sprinkle the rostis with the cheese and grill until melted, serve with the steaks and top with a parsley garnish. I only used the cheese as I had some that needed using up. For this, and other Donna Hay recipes, check out UKTV food. The porcini steaks are great!